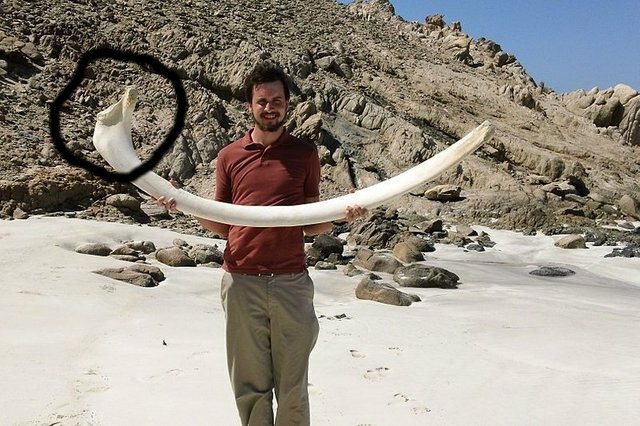 Image : Fossil whale rib with predation marks (likely shark). This one of the things that makes fossil-hunting interesting and fun. Here is the remains of a Megalodon's meal that I found on our most recent fossil-hunting expedition to Bone Valley. This is the proximal end of a thoracic rib from an unknown species of Cetacean. Of note, one end has clear predation marks in the form a series of evenly-spaced, parallel gouges into the surface of the bone. This was likely caused by a shark and possibly a small Megalodon. Thanks for looking and Happy Huntings (Fossils)! This specimen has been sold and is moving on to a new home with an appreciative collector in Denmark.